In 2019, the prospect of relations between China and the US is a topic that cannot be overlooked. Since the establishment of diplomatic ties 40 years ago, it took both sides only 13 years to turn their relations from the best period in history in 2005 to the current falling-into-the-worst period. Within these 13 years, 2008 was arguably a turning point for US hegemony as China successfully held the Olympic Games while the US was caught in a subprime mortgage crisis. The contrast enhanced Americans' anxiety and sense of urgency. Meanwhile, allegations from "Chinese arrogance" to "Chinese revisionism," and even "China to replace the US" began to attract more attention in the world. The comprehensive turn that US policy took toward China began during Obama's tenure. The reason bilateral ties remained on track was that both sides dealt with disputes in a restrained manner. In particular, the strategic dialogue between China and the US eased contradictions. However, after being sworn in, Trump abandoned the dialogue mechanism and soon started regarding China as a strategic competitor, bringing into focus US domestic contradictions and stoking populist anger at China. Democrats and Republicans are competing for sounding tougher on China, which is considered "political correctness" in the US. It is common for the US to seek enemies as the American nation has developed and consolidated throughout its history. The main topic in the foreign policy debate in the 1990s revolved around who could become such an enemy. Although George W. Bush called China a "strategic competitor," the National Security Strategy of the US in 2002 did away with such words due to the 9/11 attacks. Afterwards, China became one of the US' anti-terrorism partners and ties entered a golden era - the US was busy fighting terrorism while China focused on development and better integration into the world - until the 2008 financial crisis burst out. The US' "rebalance to Asia-Pacific" strategy in 2010 increased tensions between the two countries. Washington began to use the South China Sea as a ruse to create a geopolitical black hole. China-US relations are not going back to the good old days but no one wants them to be adversarial either. In recent years, a reprehensible tendency among academic circles of China and the US to intentionally highlight conflicts has gained ground. Graham Allison, renowned US scholar, coined the term "Thucydides Trap" to describe the China-US fatalistic game. Some Chinese scholars put forward a "60 percent theory," which implies any country with a GDP that reaches 60 percent of the US will become a target of Washington. The theory used Japan and the Soviet Union as examples but that's not accurate. When the US forced Japan to sign the Plaza Accord in 1985, the latter's GDP was only about 30 percent of the US'. When competition between the US and the Soviet Union was at its peak in the 1970s, the latter's GDP also didn't reach the US 60 percent. Thus, the theory needs some correction. It is hard for the US to suppress China even if it wants to. What's more, US capitalists are not completely obeying Trump and the country's industrial chain is very faulty. The desire of some Americans to economically decouple with China cannot succeed in the short term. Trump's former chief strategist Steve Bannon believed it would be the last window to kick China out of global capital and technology markets in the next five to eight years. He actually misled the US. It was the US not China that kept saying the US is in decline. The late strategist Zbigniew Brzezinski warned in the article "After America" that "a waning US would likely be more nationalistic, more defensive about its national identity, more paranoid about its homeland security, and less willing to sacrifice resources for the sake of others' development." It's ridiculous for Washington to regard Beijing as an enemy. Blaming China for US internal problems is also not a solution for Washington. The US is the largest beneficiary of rapid globalization - US companies are facing about $3 trillion in trapped cash overseas. Distributive justice, not globalization, is where the US problem lies. A vast majority of Americans hold the belief that a dignified job can land them a place in heaven. In this respect, Trump's promise to create more jobs will provide relief to blue-collar workers. The Trump phenomenon is spreading across the globe. There is also an increasing tendency to turn right. Problems brought by globalization, especially the consequences of the 2008 financial crisis, have caused harm to people of many countries and intensified the confrontation between elites and the working class. Thus, the real enemies of the US are domestic problems and challenges emanating from globalization, which are structural in dimension and relate to production relations. Trump's policies should look to address US production relations and distributive justice. Yale University history professor Paul Kennedy argued that great powers are usually weakened due to overstretched hegemony with heavy military spending and debt. Trump is right to not focus on wars, which have cost the US roughly $6 trillion since the war on terror. The US needs a president who concentrates on solving internal problems rather than creating external troubles. However, Trump seems to go opposite to history by upholding the banner of anti-globalization, protectionism and unilateralism. Beijing and Washington should enhance high-level dialogue to cope with the common enemy — problems and challenges brought by globalization. Future policies of both sides should avoid blind criticism and put themselves in the shoes of the other side. In particular, no country should exacerbate the confrontation by intentionally misinterpreting individual contradictions. History has repeatedly proven that improvement in bilateral relations needs time and patience. 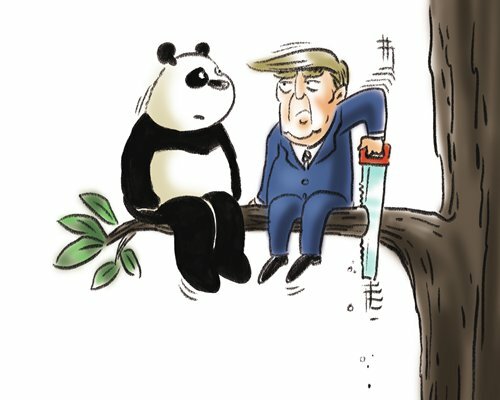 Both China and the US must not let relations freeze as it will take much more effort to warm them up. It is undoubtedly wise to prevent trade from harming China-US ties. As Trump eyes a second term, he may revise aggressive policies against China when the trade war begins to harm American people.